A 16% pelleted ration designed to improve the deer’s body condition prior to and throughout the rut. Formulated with patented AntlerMax Technology. Eliminates the need to supplement with corn. Improves antler size and mass, improves body condition. Proprietary AntlerMax Minerals – optimal antler growth, density and strength. Highly palatable – strong proprietary flavor to attract deer and elk. Superior Antler Size and Mass Promotes antler growth by improving protein quality. The unique digestive tract of deer reduces the quality of most proteins by breaking them down too quickly and diluting their value for antler growth. AntlerMax® Protein Technology protects high-quality proteins from early breakdown and delivers a higher concentration to the growing antler. Develops Good Body Size High-quality protein helps build muscle for body growth. Strong Reproductive Performance and Healthy Fawns Provides critical nutrients to help assure top fertility. Helps to increase milk production and milk quality. Helps produce strong, healthy fawns with high survival rates. Supplements Poor or Sparse Forage So deer can maintain vigor during periods of environmental nutritional stress. Optimal Antler Growth, Density and Strength A power-packed nutritional package with ideal amounts and ratios of vitamins and minerals for optimal antler growth, reproductive success and enhanced growth rates. High Palatability Enhanced with strong apple flavor to attract deer to the feed to so they receive the benefit of a balanced diet. Optimum Performance Superior ingredients ensure high feed intake for optimum performance. 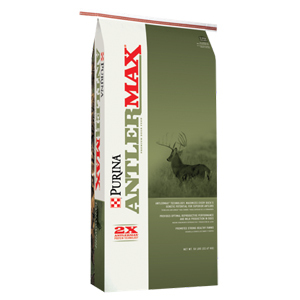 Feed Purina Mills® AntlerMax® Deer Chow® 16 to deer, elk and other game starting in January when antler development begins through September or until antler growth is complete (antlers harden). Place under shelter near high animal activity and close to a constant supply of fresh, cle an water. For best results, place feed in a free-choice protein feeder. Consumption will vary depending upon season of the year, nutritional needs of the animals, availability of other foods and familiarity with pelleted feeds. Deer and elk unaccustomed to eating pelleted feed could require 30- 45 days to achieve high intake. To speed this process, blend 75% corn with 25% pellets and gradually eliminate the corn over several weeks as deer accept the pellets.